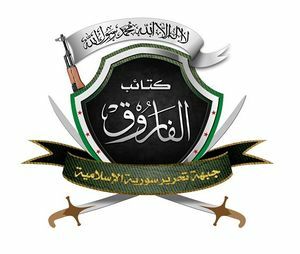 The Farouk Brigade (كتائب الفاروق) is part of the original Free Syrian Army and was founded and originally led by the defected army officer Abdulrazaq Tlass from Ar Rastan in June 2011. It operates mostly in the Homs region. It came to fame through Western TV reports from Baba Amr in early 2012 where Tlass was stylized as hero of the people. 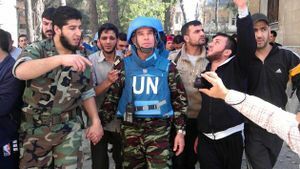 In the following months the facade got cracks with reports of an execution regime they operated and general brutal behaviour that alienated even fellow militant groups in Homs. They have been implicated by alleged eyewitnesses in the Houla massacre of late May 2012. The militant Abu Sakkar, who became famous in 2013 through a video where he is seen biting into the organs of a dead soldier after cutting them out, is a founding member and can be seen together with Abdulrazaq Tlass in some Western media appearances. The Farouk Brigade was a major force on the side of the militants in the battle of Al-Qusair. In early September 2013, two western reporters who had been taken hostage by the Farouk brigade claimed after release that they had overheard communication implying that the alleged chemical weapons attack of August 21 has been a "rebel" provocation and the number of victims exaggerated. Around the same time, the Farouk Brigade has taken part in the assault on the ancient Christian town Maaloula. The brigade's name Farouk ("the one who distinguishes between right and wrong") refers to the early Muslim Caliph Umar, who is one of the three successors of Mohammed considered to be illegitimate by Shia Muslims, and illustrates the religiously driven and sectarian nature of their ideology. Sources and additional information can be found below, on the discussion page and on the discussion page of the article about Abdulrazaq Tlass. This page was last edited on 18 January 2014, at 22:05.